The real estate market in Texas is hot, hot, hot right now which means multiple offer situations are becoming commonplace. Multiple offers occur when several people like, and want to buy, the same house. Many times this will happen during the first few days the house goes on the market, and the listing agent will wait, collect several offers, and then the sellers will choose the one that appeals to them the most. Sellers have a few different ways of dealing with multiple offers. Sellers can accept the most attractive offer right off the bat (usually above-asking price, or with extra perks thrown in). They could also inform all potential buyers that there are multiple offers, and hold out for an even better offer. They could ‘counter’ one offer while putting the other offers to the side awaiting a decision on the counter offer. Lastly, they could counter offer and negotiate with only one offer while rejecting all of the others. Do remember that while the listing agent can offer suggestions and advice, the decision about how all offers are handled are ultimately made by the sellers. Depending on what the seller chooses to do, the buyer’s agent should treat the situation differently. Choosing how much to offer initially is incredibly important. Offer too low a price, and your offer may be rejected immediately. Offer too high a price, and you risk paying more for a property than the seller might have required. In multiple offer situations, there are usually several full-priced offers on the table, so if your agent anticipates this they may suggest that you bid a bit higher. “In a sellers market, I highly recommend that my buyers put their best foot forward and make a strong initial offer. We may not get a second chance to make an adjustment," said Seth Thompson, Broker and Sales Director at HomeCity Real Estate. Many times, if there are multiple-offer situations the listing agent will contact all of the buyers agents and instruct them to put their ‘highest and best’ offer in. This lets them know that they will be competing for the home, and they are advised to put in the absolute max offer that they would consider paying for the house. Don’t be discouraged when a seller asks for ‘highest and best,' what’s the worst that could happen? (That your offer won’t be accepted.) So you might as well try! However, you will want to make the highest offer you can based on your buying criteria. Rather than guessing what the other offers are in a highest and best situation, just offer as much as you can considering your price limits. Other factors such as how much you love the house, and what comparables in the neighborhoods sold for will help you decide this number. 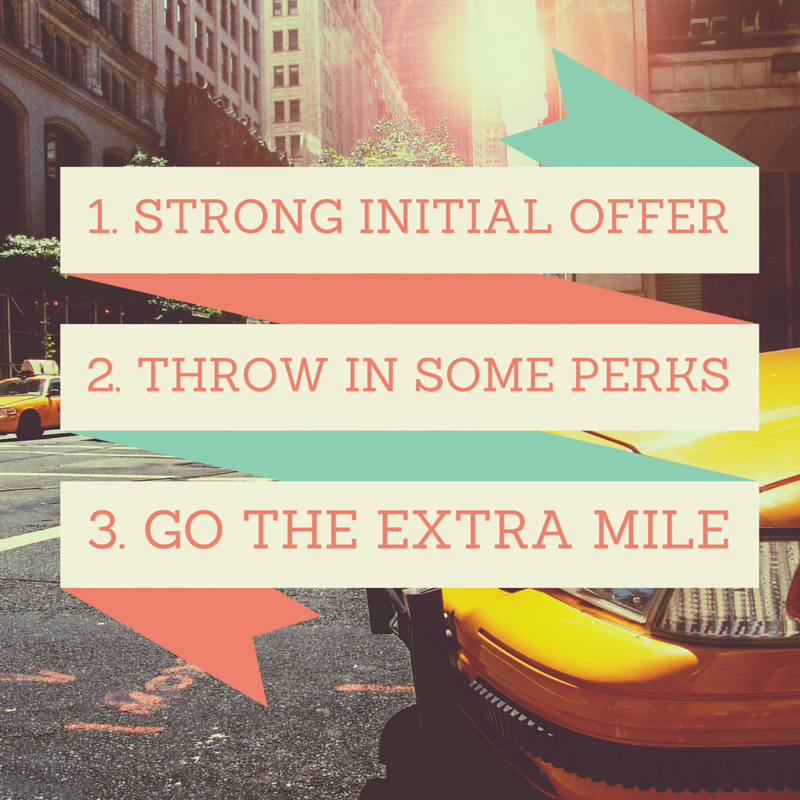 Throwing in some ‘extras’ to sweeten your offer is a good way to win a multiple offer situation. One way to do this is through no-hassle financing options. A cash offering is one of the strongest offers you can make, as they won’t have to deal with the complications of financing. Make sure you have proof of funds (a letter stating that you have the cash). If you don’t have cash, explain your financing, and make sure you are pre-approved. Using conventional financing vs. an FHA loan can sweeten the deal. Some agents can use a lender that does not require an appraisal or repairs (this will help expedite the process for the sellers and is appealing to them). Another extra is if the buyer chooses to pay their own closing cost and not ask for any assistance from the seller. This increases the net to the seller and is attractive to them. An increase in earnest money can also get the sellers attention, and increase the chances of your offer being accepted. One can also shorten contingency periods or waive them, and be flexible about their closing date. Basically, anything that makes the closing process less daunting for the seller is seen as advantageous. An excellent way to make yourself stand out is to personalize your offer. While this may not be as important with foreclosures (where you are dealing with a bank), this can be a great way to win a sellers favor. One way to do this is with a personal cover letter. Write about who you are, why you love the home, and who plans on living there. Introduce your family members and add pictures if you can. If the seller identifies with you, they are more likely to want to sell the home to you. Selling a home is an emotional process, and homeowners often want to know that the place they cherished for so long is going to the right people. Other tricks of the trade include having your agent hand deliver the offer letter and submit it quickly so that it’s on top of the stack. Including a photocopy of the earnest money check shows you are serious and ready to move forward quickly. You can even summarize your key offer terms on a quick reference sheet so that the sellers can easily distinguish your offerings. There are so many other factors besides the price to make your offer more attractive. A good real estate agent can help you navigate and win a multiple offer situation.